Vintage Racing Club of BC | Autumn 2012 Vantage Published! 15 Oct Autumn 2012 Vantage Published! 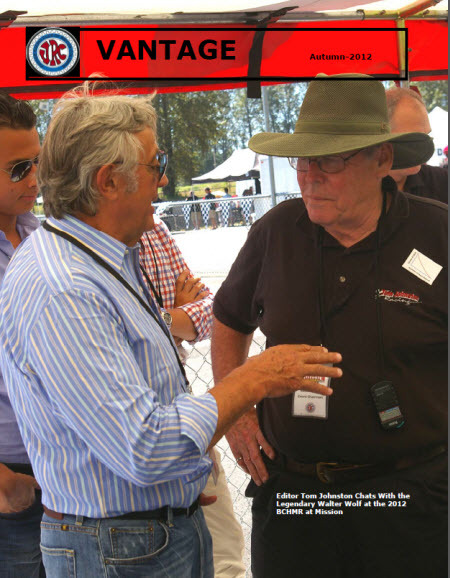 Editor in Chief Tom Johnston has just published the Autumn 2012 edition of Vantage – the VRCBC Newsletter. This time, Robin Fairservice tells the story of Elva Cars, which started as a very small specialist builder in the mid – 1950’s and eventually went on to build the excellent Courier and many successful sports racers. Mike Tate talks about meeting our special guest, Walter Wolf at the BCHMR. Tom Johnston tells the story of Port Moody’s IOCO Hill Climb. There are also two ‘you were there’ race reports: Tom describes his experience with his JM3 Formula Atlantic car at the ‘Monterey Historics’ in August and Madeline Wood describes her dad (Ian’s) weekend, which included a black flag(!) at the CSRG Charity Challenge at Sonoma Raceway in October. You can find this edition and all of the previous Vantages under the About VRCBC menu, or download it directly by clicking here.